Capricorn January 2018 Horoscope foretells a fabulous month in a great year. Planetary strength is almost equal in the northern and southern sectors of the horoscope. Depending on the movements of the moon, the emphasis shifts from professional matters to home and family. During the first half of January 2018, family issues will be important for Capricorn zodiac sign while during the second half of the month career and personal success will be in focus. More than 80 per cent of the planets are in the eastern half of the chart indicating that enterprise and ambition will rule this month. You are not dependent on others or situations to achieve your objectives. There is no need to exercise social charm or adaptability to succeed for Capricorn personality. You bulldoze all opposition with your aggression. The January 2018 monthly horoscope is suggesting that though family and home occupy your major attention, you will excel in your professional activities also. Your family is supporting your career ambitions this month. Business travel will be profitable. The 2018 astrology forecasts for Finance indicate that your monetary situation improves by leaps and bounds after the 20th.With the influence of the Sun, you improve your earnings by cutting down unnecessary expenses and by reducing the number of employees. This is an ideal time to clear pending loans for Capricorn born. Your financial acumen is great and you are able to make money with your own resources as well as with investments from outside. Speculations based on good judgement will yield good returns in the month of January 2018. The solar eclipse of the 4th will have deep impressions on the financial situation of family members. Astrology 2018 foretells that all legal issues concerning finances of your spouse or lover will be settled. The 2018 Love Horoscope predicts that family life will be excellent and you are putting extra efforts to enhance your personal image. Singles will have many romantic opportunities, but they are not serious about permanent relationships. Goats will be interested in philanthropic activities and this will further boost your image. The monthly horoscope 2018 indicates that health issues will not pose any problem.You should not forget your fitness routine. Influence of Sun will result in improving the energy levels and will make you cheerful. If there are any problems due to dietary excesses, detoxification foods will help you to maintain your health. 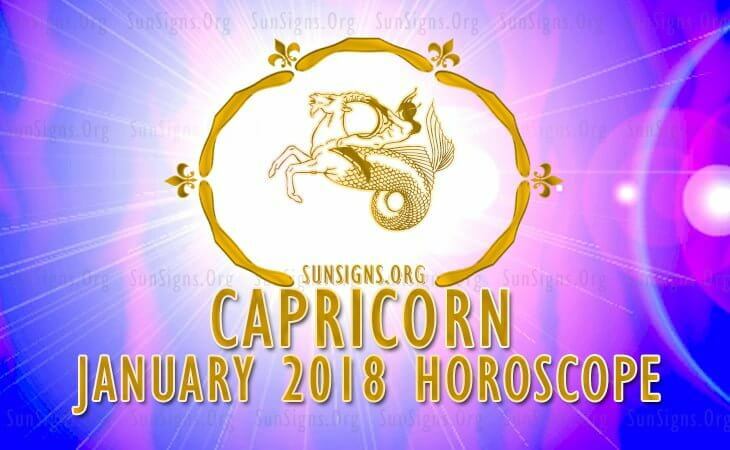 To conclude, January 2018 promises to be a wonderful month for the Capricorn persons with all-round progress and prosperity. Refer Numerology Horoscope 2018.